Location Based CLI Routing Services from Numbers Plus, divert your callers depending on their geographical location. One of the most common applications of CLI routing is to route calls to the nearest (or most appropriate) destination to the caller, often described as Location Based Routing. This is possible, because the CLI for UK fixed lines is geographic in nature. An example might be to deliver all calls with an 0121 prefix (Birmingham) to a Midlands office, whilst callers with an 0161 prefix (Manchester) would be routed to a Yorkshire customer service team. 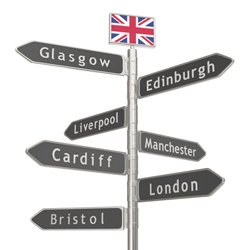 Since there are around 650 UK area codes, Location Based Routing can be extremely precise or quite general. CLI Based Routing can be setup on any of numbers, for more information or to get a quote please click here to contact us. Route calls on any part from the prefix, right down to local area. Have different CLI Location rules depending on the time of the day or day of the week. Offer a catch all routing if the inbound CLI rules are not matched. Full control over what happens if a inbound CLI is rule is match, ie route onwards, play audio, voicemail etc. Retail chain-outlets can have a single telephone number nationwide and use location-based routing to route callers automatically to their local store. Franchises can be set up under a single brand with each franchisee servicing a particular locale and fielding its calls. Inbound sales enquiries can be relayed automatically to the regional sales manager appropriate for the caller's location.